This entry was posted on Tuesday, September 4th, 2018 at 1:48 pm	and posted in Cthulhu Game Aids, Dateline: Lovecraft, News & Updates. You can follow any responses to this entry through the RSS 2.0 feed. 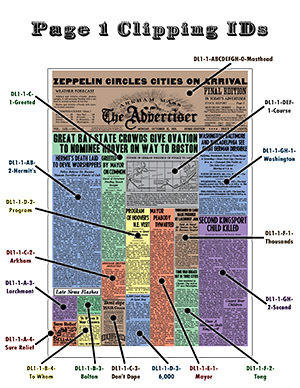 Do you have plans to use the Dateline Lovecraft newspaper as containing vital clues to scenarios set in future timelines? The idea of using pieces of Dateline: Lovecraft as resources for games set decades after the 1920s (maybe even in modern-day) is touched upon in the Guidebook that comes with the core DL product. In that sense we’ve definitely considered that to be an option for exploiting in follow-on supplements. What we cover (assuming we raise the funds to do so) will depend mostly on the writers we commission. If someone has a great idea for a modern scenario then we will definitely publish it. Same goes for game system: while I imagine that many writers will want to contribute scenarios for BRP-based systems, we’re open to others as well. It’s probably worth cryptically mentioning that the core Dateline: Lovecraft newspaper has several “easter egg” type clues that are quite subtly woven into the newspaper — waiting for clever people to discover. One of those specifically relates to an idea that I’d like to develop for a multi-part scenario which skips across decades, and ends in a version of the Mythos post-Apocalype: but those are plans for a possible future rather than a definite one.